Greetings once again gang to another PU it Stinks article. First off, I’m sure that many of our regular viewers have been wondering what’s been up with the minimal content lately. In a nutshell, it all boils down to my Alienware Aurora having a driver induced meltdown and Dell customer service (sadly, the now parent company of the once great independent startup) sucking every ounce of life out of me as the restoration of my once great mechanical companion became an inevitability. Like a lot of folks in the creative world, I’m not generally one to allow too many people to peek behind the curtain to see the inner workings of what I’m creating. It’s not that I’m protecting trade secrets, or think that what I’m doing is so important that I can’t share how I did what I do with the world - I just think that the world’s become a little too transparent is all and keeping the ‘inner workings’ a little vague is just my way of trying to keep it a little more mysterious - maybe (dare I say) even a bit more magical. So... here we are. Three months later backups upon backups of operating systems, drivers, all my most precious files and other yadda-yadda-yadda have been created. Through it all were countless hours of torture with the Dell ‘Concierge Service’ (an over priced way to get more of your hard earned money after your warranty expires and the ONLY reason anyone at Dell will even bother with you after the fact), Dell technical support (who if you own an Alienware will eventually send you to the folks in Costa Rica in their software and gaming division), and finally one of their local tech contractors here in Pittsburgh that not only service Dell products, but also Apple, IBM, Xerox (you getting the picture here?). To say that all of this has been beyond the pale of frustrating and exhausting would be an understatement. No worries though - all has come to pass and we can continue on with business as usual (or unusual as the case may be). As I stated before, all of the content created for Pittsburgh Underground is created on my Alienware Aurora which I purchased a few years back, needing a high end machine in order to pursue my need to create. Alienware had the specs and the attention to design that made it a no brainer. It also started out as an independent company that had gamers in mind due to the high end graphics that most modern games utilize so I knew it would be perfect for graphics, illustration, video sfx, and industrial design work. Now we get to the cloud surrounding the silver lining of all Alienware products - Dell. 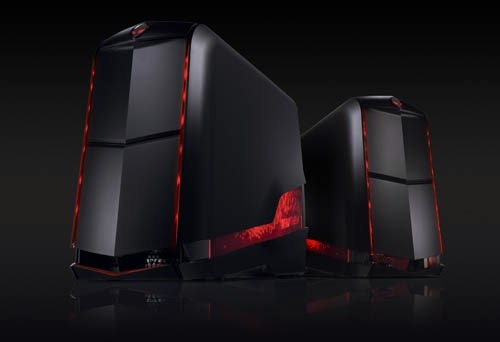 Dell acquired Alienware roughly around 2006 as a way to try and garner a piece of the gaming market pie that their XPS systems failed to capture (although practically copying everything, sans a sense of style, from their competitor Alienware). Now Alienware is a subsidiary of Dell who, if you believe anything written on the internet, has one of the worst customer service and tech support in the world. When you finally commit to a piece of tech due to it’s amazing specs, pulsing lights, and all those fancy buttons, you really don’t want to believe the rumors about the substandard support system in case something ultimately goes wrong (besides, it’s a brand new product when you buy it - what could go wrong?). Sadly, something always goes wrong and when you least expect things to go from bad to worse, Dell enters the picture redefining the word. As with most computers the more programs you add, the more chances you have of one plug or driver conflicting with another. After about 3 years, the machine can’t help but fight itself doing simple tasks. Lots of lag and in some cases, strange anomalies like the one I kept getting - random black screens that made the computer inoperable. My Alienware’s new black hole was a known, yet completely unfixable event that seemed to be happening to many people that owned the product. I can’t tell you how many countless forums I had visited, each with their own unique way of dealing with (but not really fixing) the problem. Keep in mind that my search for a solution began at the beginning of 2013, grinning and bearing my random bouts of inoperability until I finally had enough around the month of May. At this point I had finally contacted Dell. Now, at this point (as with most gadgets that start acting out of the ordinary) my Alienware was out of warranty. This ment that I had to purchase a $300.00 fee to become a member of the Dell Concierge Service. In a nutshell, if you are a member of the service, Dell will finally bother to talk with you about your computing issues and then send you through a series of endless customer service agents and technical ‘specialists’ in order to find one that either has the knowledge, let alone the willingness to serve you. On my first try it took roughly four different agents, repeating my problem four separate times in order for them to finally realize that I had an Alienware, not a Dell computer (evidentially, although owned by the same company, are viewed differently from within the confines of Dell Inc.). I finally talked to what felt like a very preoccupied tech from India who stated in order to fix the problem I would need to completely wipe the machine clean (in otherwords, he had no real knowledge what-so-ever on how to diagnose, much less fix a known issue that an the entire Alienware community was talking about on the Dell forums). It felt fairly obvious that his plan was to get me off the phone as soon as possible to go back to whatever he was doing before he answered. Let’s face it gang - anyone who owns a computer knows that wiping a machine is dicey business. You’re entire life lives on your computer, especially if you are a designer. All your hard work, all your programs in order to create, EVERYTHING lives and dies by the machine. What really killed was when the tech said that ‘we recommend that you do this once a year’. Who the hell wipes their computer once a year to reinstall their entire operating system, drivers, programs, fonts, etc...? Obviously, this was not going to happen immediately as backups would need to take a priority first meaning I would need a 2.5 terabyte drive to make my essential backups, and then revisit the idea of starting from the ground up. Fast forward to December of 2013. The backups have been made and during Xmas vacation I decide to bite the bullet and restore my machine to factory settings using the disks I so neurotically created using Alienrespawn - Alienware’s answer to backing up your essential operating files. I created this the first week I had my computer, just in case something as tragic as the situation I was currently in occurred. As usual, I couldn’t reach one helpful soul at Dell that could step me through the process so I ended up checking out the Dell website under “Support” in order to follow their instructions for how to restore my Alienware to it’s factory settings using the disks I created three years ago. Long story short, it went through the entire sequence until it came time to load the operating system from the disks. It spun for 24 hours only to get as far as 1 percent complete (defective disks created with defective Dell software - what a surprise). Sadly, I was then forced to contact Dell for what felt like the millionth time. Luckily, I was finally sent to a great lady named Noelia in Alienware’s gaming department in Costa Rica who spent the next five hours not only helping me to load the operating system and drivers onto my machine manually, but also found a piece of hardware that had fried due to another ‘known issue’ with a piece of Dell software that supposedly gives it enough of a jolt that it enables the thermal controller (the thing that controls the temperature in the rig) completely useless. She was even nice enough to make arrangements for a tech to visit me for free to take care of the issue. Noelia and the folks in the Costa Rica gaming division became the only bright light in this otherwise twisted story. That’s right gang, now my poor rig would turn on for about five seconds and then immediately power down. I was told that a new power supply, mother board, and new thermal controller was ordered - essentially in order to rebuild my system from the ground up (I was told it’s usually one of those three things). Fast forward to the following week week. New tech, still calling the same wrong number to make an appointment (this was the second time I had to call World Wide directly to make an appointment because of Dell’s inability to click the right checkbox next to the correct phone number) to hopefully fix what the first tech screwed up. Granted, the second tech was great - not only did he stop by after I was finished with work to install the new power supply, but also found out what the first tech forgot to do - Plug the new components cable into the power supply. That’s correct gang - the so-called tech forgot to plug in the only thing he needed to install (and scratched my case in the process, not using the provided anti-static matte he’s required to use). At this point, my head hurts. We are now in the final stretch of the Dell Debacle of 2013-14. Now, before any software, drivers, or anything else can be loaded, new backup disks need to be created using updated Dell software. As usual, this is something I try to do myself by going to the Dell support page and loading up a new version of Alienrespawn which, surprise -surprise, doesn’t work. It doesn’t work for me, nor does it work for Jenia, the latest tech from Alienware’s gaming division in Costa Rica to help me. Instead we dowloaded and installed DellSafe Local Backup and Recovery which oddly, loads up as Alienrespawn on my machine. After two days of making backups, I was then ready to make an external bootable recovery drive (just incase anything becomes corrupted in Windows and I my machine won’t turn on). So I bought another $80 external drive (a Seagate - so far I find their products exceptional) and created the bootable drive with little trouble. I even received an email from Jenia who was nice enough to follow up with me (but sadly was let go from Dell for some unknown reason, as a follow up phone call I placed to her was met with the news).